Zen Studios has announced four more Marvel superhero-themed tables for its popular virtual pinball titles. Unless you've been living in a cave for the past year, you're likely well aware that Marvel Comics' movie-making wing has a film coming this summer based on the company's flagship superhero collective, The Avengers. And unless you've been living in a cave since 1955, you're likely well aware that this means we're going to be drowning in Avengers tie-in merchandise very, very soon. Luckily, thanks to the virtual pinball maestros at Zen Studios, not all of those tie-ins will be laughable crap. Specifically, I'm referring to this morning's announcement that the company has crafted four new pinball tables for the Xbox Live Arcade's Pinball FX2 and the PlayStation 3's downloadable Marvel Pinball. Marvel's The Avengers table reflects the events of this summer's highly anticipated blockbuster, pitting all six Avengers against Loki's invasion of Earth. Nick Fury commands the team of Iron Man, Captain America, Thor, Hulk, Black Widow, and Hawkeye, each character represented by a customized ball that echoes his or her own appearance and power set. Hulk Smash! After the Hulk's banishment to outer space, he returns to Manhattan to seek revenge against the Illuminati and wage war against the X-Men, Iron Man, the Fantastic Four and Doctor Strange in World War Hulk. The Silver Surfer and Adam Warlock enlist Earth's Mightiest Heroes - including you - to recover the six Infinity Gems from Thanos and save the universe in The Infinity Gauntlet. The intense pinball atmosphere heightens as each Infinity Gem produces a special effect on the table, such as literally flipping the table upside down with the Reality Gem. The Avengers must defeat Odin's long-banished brother, the Serpent, and free the world from the grip of chaos in Fear Itself. Featuring a table design unlike any to date, Fear Itself utilizes magnetic energy in ways no one has ever before experienced on a pinball table. Fans of Zen's earlier Marvel-themed tables will notice that these upcoming offerings are no longer focused on specific characters, and are instead based on events in Marvel's immense storytelling history. More crucially, they are focused on events that are just esoteric enough to entice comic book geeks to give the games a look -- which is great because seriously people, outside of PopCap's library, Zen's pinball titles are the most addictive downloadable games available. Anyway, the important bit is that all four of these tables are scheduled to debut "this spring" and that they will integrate seamlessly with both Pinball FX2 and Marvel Pinball. 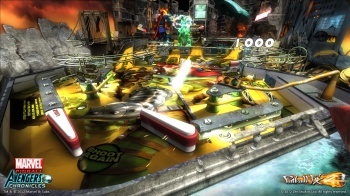 Additionally, these four tables are set to be released on the Vita as a standalone pinball title.